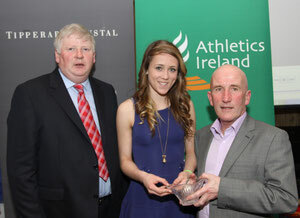 Amy Mc Teggart Boyne A.C.receiving her Athletics Ireland Louth Star Award in Sheraton Hotel Athlone on 3rd March from John Mc Grath Chair Juvenile Committee , Ray Flynn Chair of High Performance AAI - louthathleticss jimdo page! Link to photos from Athletics Louth 2017 Awards Night: pjrphotography.zenfolio.com/p592758913. Front (kneeling): Eimear Doyle; Middle (sitting): John McGuone, Eileen Callan, Seán Callan, Mary McGuone; Back (standing): Jonathan Commins, Kate O'Connor, Georgina Drumm, Gabriel Bell, Amy McTeggart. The annual Athletics Leinster Awards Night took place in the Seven Oaks Hotel, Carlow on Saturday, 21 January 2017. The County Louth contingent in attendance thoroughly enjoyed a great night of fellowship and celebration, which was made all the sweeter by several awards coming their way. 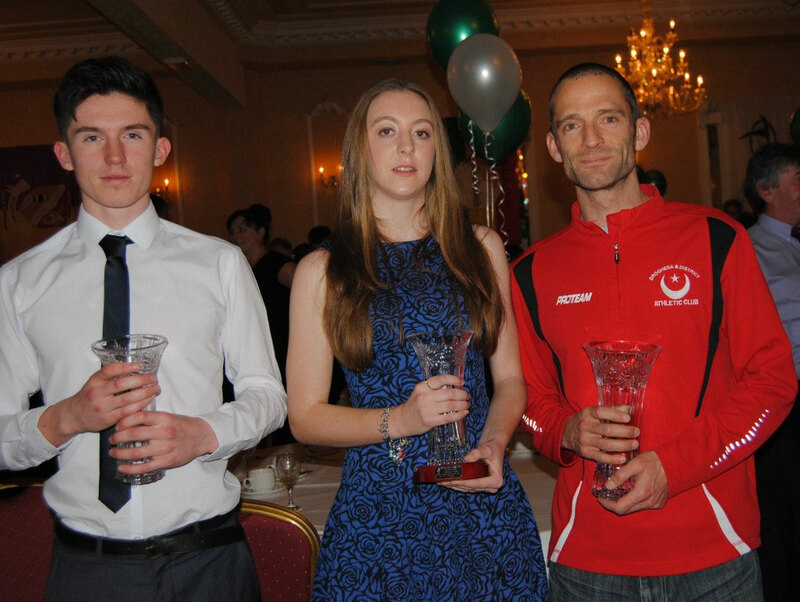 Amy McTeggart (Boyne AC) received the Senior Athlete of the Year award for having the best results of any athlete from County Louth in Leinster Championships during 2016. The Athlone IT student won gold in the High Jump and Pentathlon outdoors as well as in the 60m Hurdles indoors, and backed that up with a brace of bronze medals in the Long Jump and Javelin outdoors. 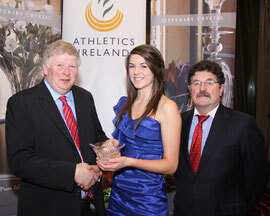 The equivalent award for Juvenile Girls went to Kate O’Connor (Dundalk St Gerard’s AC). She won an incredible six provincial titles at U17 level – in the 200m, Long Jump and Javelin outdoors and in the 800m, High Jump and Long Jump indoors. This very talented multi-eventer, who finished seventh in the heptathlon in the European U18 Championships last July, also took silver in the Shot Putt outdoors. There were joint winners of the Juvenile Boys’ award as Gabriel Bell (St Peter’s AC, Dromiskin) and Jonathan Commins (Ardee & District AC) were both honoured. Coincidentally both these fine young athletes competed in the U16 age group during 2016. Gabriel won the Long Jump titles both outdoors and indoors and also claimed silver in the 200m and High Jump outdoors and bronze in the High Jump indoors. Jonathan was crowned Leinster champion in the 250m Hurdles outdoors and won no fewer than four silver medals – in the 100m Hurdles and Shot Putt outdoors and in the 60m Hurdles and Shot Putt indoors. Young Eimear Doyle (Boyne AC), acting on behalf of her club, was presented with a shield to honour the Drogheda-based club being ranked as the best club in the Leinster U9, U10 and U11 Pairs’ competition in 2016. 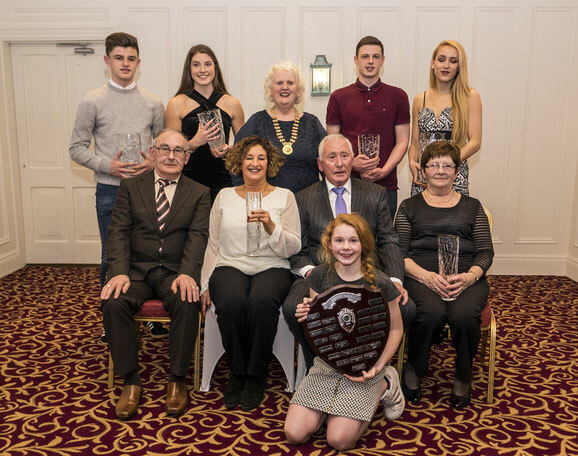 Husband and wife John and Mary McGuone (Blackrock AC) received an Outstanding Service award in recognition of their sterling work as starters at so many competitions over the years. 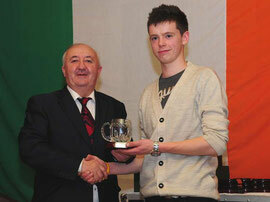 Another recipient of an Outstanding Service award was Seán Callan (Clonliffe Harriers AC). 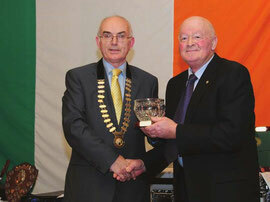 Seán, a native of Ardee who has been living in Dublin for many years, is a well-known supporter of Irish athletics. Garry Campbell (Dunleer AC - Boys), Rebecca Carr (Blackrock AC - Girls) and Mark O'Shea (Drogheda & District AC - Senior) after being presented with the 2014 Louth Athlete of the Year Awards by Athletics Leinster.